Yesterday, I pulled up to a red light by the Beverly Center and noticed an older man with a windbreaker waiting to cross the street. I look closer at the windbreaker and notice a patch on his shoulder in the shape of the great state of Texas. It looks as if it represents some high school. I think to myself, "Self, this guy must be a high school football coach from Texas". He definitely has that high school football look (whatever that means). I peer over to see if I can recognize which high school this dude is from. I can't tell, but I do hear the car next to me giggling. I look over and it's full of girls giggling and one has her camera out.... I look back at "coach" as he's walking in front of me and it's Jon Voight. 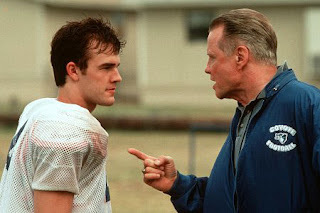 And he's wearing his windbreaker from Varsity Blues. It says Coyotes across his back.